As cities become increasingly significant to development and environmental crises at multiple scales, there is a growing need for research that can contribute to both theory and practice. The term “urban political ecology” (UPE) describes a critical approach to studying cities across a number of themes, ranging from more traditional environmental issues (such as climate change, air pollution, and nature conservation) to urban flows (such as sanitation and electricity provision). Many scholars believe that there is a need for a more explicitly political approach to these topics that draws attention to who wins and who loses as cities change, as well as to how urbanization as a process is shaped by power relations. 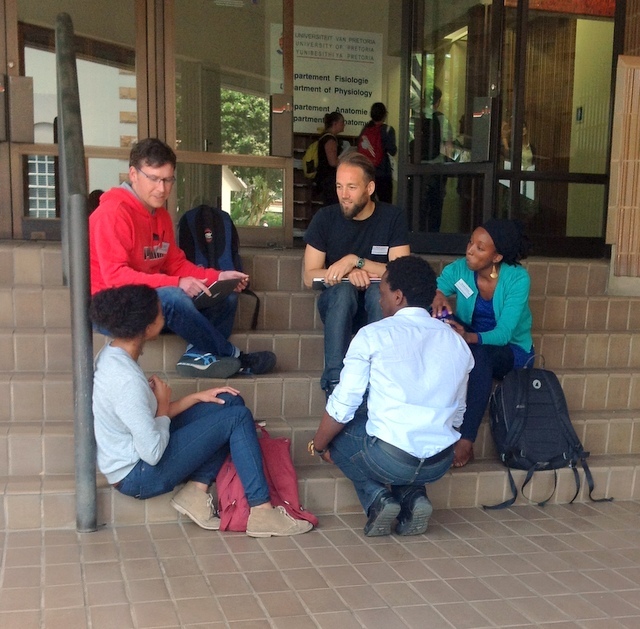 These ideas informed the Urban Political Ecology in African Cities Workshop, held at the University of Pretoria in South Africa from 22 to 26 September 2014. 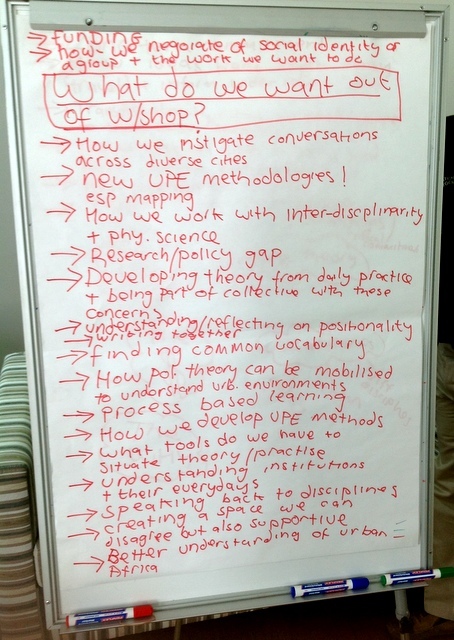 Organized by researchers affiliated to the Situated Ecologies collective (SUPE), the workshop drew in early-career researchers to discuss critical approaches to urban environmental research, drawing on recent conversations in the literature about theory and methodology. A major concern was to discuss how the scholars and cities of Africa and the global South could more fruitfully participate in wider theoretical discussions. It aimed to support new ideas, research collaborations and grant applications and provide an opportunity for discussion and in-depth engagement around these issues. The idea was to assist young researchers through targeted discussions on establishing research partnerships, funding applications and academic publication. The workshop was arranged over five days. The first day started with the obligatory welcome from Joe Pierce, the workshop facilitator, and introductions by us, the participants. Alan Mabin (University of Pretoria), in typically lyrical style, introduced us to the city of Pretoria and its contested histories, as well as the Capital Cities Institutional Research Theme–a cross-faculty initiative recently started at the University of Pretoria. Jonathan Silver helped us to situate ourselves and recognise our various strengths and expertise through an “activist skills and knowledge” (ASK) session–a simple icebreaking exercise. Then we were invited to set out our goals for the workshop both as individuals and a broader group. Our responses ranged from the practical (for example, securing funding for group research), to the methodological (developing new UPE research methods and modes of interdisciplinary work), to the conceptual (establishing a common vocabulary and set of ideas to inform a radical and critical understanding of African urbanisms). We spent most of the remainder of the first day thinking over the meanings of the term “urban political ecology”. We thought about the theoretical lineage of UPE and how this framed its ideas and objectives. We asked questions: Why is the word “urban” included in the term UPE? How does its inclusion make UPE different from political ecology more generally? What does the word “ecology” lend us in thinking about “the urban”? What sort of practical and epistemological issues arise in doing UPE research in Africa? What normative and political ideas underpin UPE? We considered that, in essence, UPE is about understanding how cities and urban inequalities are produced through material and discursive processes, with the objective of developing new bases to intervene in these processes. UPE views the city as a work-in-progress–a hybrid of human and non-human forms–that is shaped by relations of power as well as the obduracy of urban objects. It moves beyond a simple understanding of cities as “containers” of social processes. The political intention of UPE is carried through the use of social justice and equity as guiding normative ideals (while recognizing that normative ideas themselves may be enrolled in urban processes to the benefit or detriment of different individuals and groups). Based on these conversations, we turned our various issues and concerns into a set of questions (ranging from practical to ethical and conceptual topics), with the intention of presenting these to a selection of more experienced researchers the following day. The morning of our second day was set aside for discussing the UPE literature, its various strengths and possible weaknesses or oversights, facilitated by Henrik Ernstson. We discussed and compared the approaches of scholars including AbdouMaliq Simone, Alex Loftus and Matthew Gandy. Our discussions ranged widely, but several issues stand out in my mind. Firstly, we agreed that ethnographic research methods are particularly important in the African urban context, and are key to developing a “situated” understanding of how unequal urban socio-natures are produced. While acknowledging that it is not always possible for all researchers to do this sort of work, ethnographic methods allow researchers to discover how questions of identity (including race and gender), subjectivity, knowledge, and everyday practice tie into the “unseen” ways in which power is articulated to produce and reproduce urban inequalities. But this raises important questions: for example, how best can we engage with communities in research, and ensure that these engagements result in lasting relationships? Secondly, a situated or African UPE enjoins us to think about the political economy of how knowledge is produced and circulates between different contexts. Any attempt to “write from the African city” forces us to engage with questions of how international publications operate, how they might privilege Euro-American theories and debates, and how African intentions and perspectives may be undermined as a result. 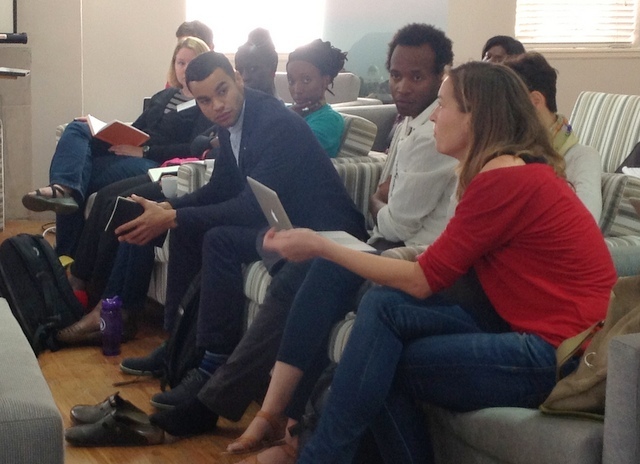 Thirdly, we debated whether African experiences and scholarship could contribute to broader political thought about how cities can and should change, particularly through the notion of “radical incrementalism”. While we need to further develop and refine this idea, it is clear that modes of political organizing and acting seen in African cities can provide a springboard to imagine new urban political potentials and practices more generally. Some of our best discussions focused on what is still missing from the UPE literature in Africa and more generally. 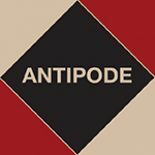 In theoretical terms, issues of subjectivity and modernity–and how these discourses and practices intersect with other drivers of inequality–are clearly under-emphasised. UPE also has some way to go in adequately engaging with feminist theory, and in accounting for the many ways in which race and violence (including forms of “everyday terrorism” and clandestine violence) structure urban life. In short, we lack the “situatedness” that would enable us to see the full variety of subjective and material forces reproducing urban inequalities. Our second afternoon provided an opportunity to hear and learn from experienced UPE researchers. Garth Myers, Rosalind Fredericks, Jeremiah Njeru and Colin McFarlane used internet-based video conferencing to share their responses to the set of questions we had developed the previous day. Luckily we had the privilege of hearing from Shuaib Lwasa in the flesh. We asked the “UPE experts” (as they became affectionately known) to talk about their experiences in writing and disseminating research, in writing proposals and landing research grants, in using and discovering theory, and in trying to engage with and make an impact on communities. We asked for the good and the bad: What were their regrets? How could they have done things differently in their early career? The UPE experts replied to these provocations in characteristically eloquent yet challenging fashion. Rosalind Fredericks reflected on her wealth of experience in collaborating with social movements, youth groups, and hip hop artists in Senegal, and how she has worked to sustain these relationships. Writing, we heard from Garth Myers, can be driven by fear as much as by talent and passion. But Colin McFarlane challenged our assumption that we should aspire to be “prolific” writers: people write in different ways for different reasons, and this is both acceptable and healthy. Also, while it is important to engage with communities and position one’s work as a way to empower people, in some circumstances it is important to defend the (perforated) “red line” between research and practice–sometimes it is important to do “research for research’s sake”, without the political influence that embeddedness can bring. Later, we were asked to represent the perspectives of the UPE experts through creative ways, such as drawing and performance–with a prize bottle of wine awarded to the most innovative effort. That evening we staged an impromptu movie night, watching urban African movies under the Pretorian night sky. Films from Ouagadougou, Lagos, and Johannesburg sharpened our focus on the aesthetics and practices of everyday life in these cities. We listened to stories of hip hop Burkinabé as the cool spring breeze sent new leaves dancing above our heads. Day three was about getting out into the city and putting some ideas into practice. The organizers divided us into multidisciplinary teams, with each assigned to a particular theme: [i] transport; [ii] parks/green spaces; [iii] security/carcerality; [iv] urban landscape; and [v] commercial spaces. Days four and five were then used to refine the research ideas and report back to the larger group. 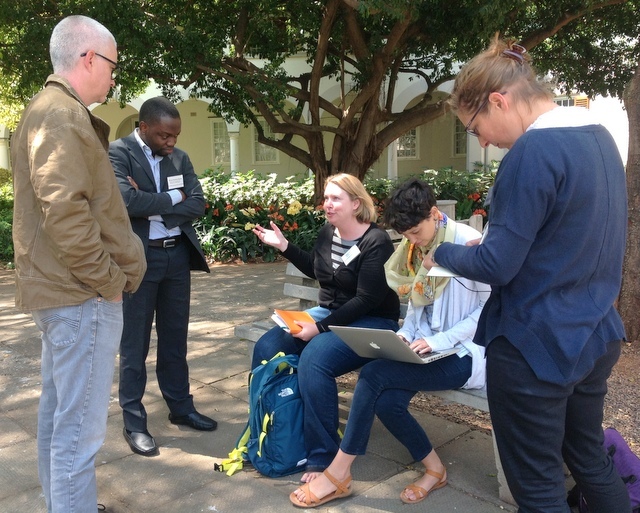 In addition, short interventions were arranged to enable us to reflect on key African urban research problems and areas of knowledge or expertise, as well as innovative methodological approaches to studying African cities. The outcomes of the group work are presented below. Each summary has been written by the group members concerned. Our group took an exploratory approach to the issue of transport and infrastructure in Pretoria. Our initial consideration of the topic centred on transportation access and use. Driven by the question “What does it take to get from point A to point B?”, we relied on a group member with local expertise to get us to different points in the city using multiple modes of transportation. We paid particular attention to the ways race, class, and gender are negotiated in the use of different forms of transportation. Our fieldwork revealed some interesting findings. One was that a convenient connectedness exists between some forms of transport (e.g. private cars, bus rapid transit and the upmarket Gautrain service), but other modes of transport suffer from a (perhaps intentional?) disconnect from these systems (e.g. separate stations exist for conventional and Gautrain rail services in central Pretoria). We found extreme price differences affecting the use of different public transport systems, and that the use of different modes was distinctly segregated by race and class. We asked, is this obvious racial and economic differentiation of transport use a historical relic, a legacy of apartheid, or an intentional and contemporary policy? Or, is it a combination of some or all of these factors? 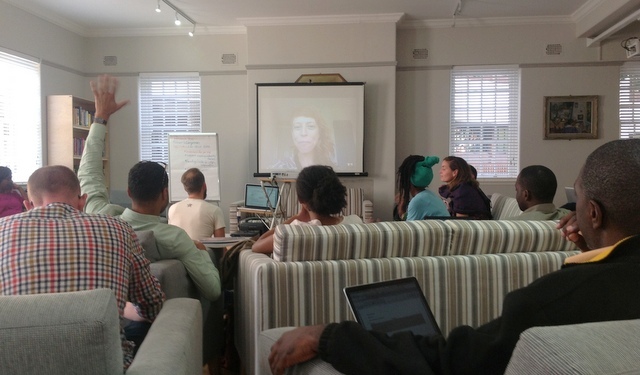 When it came to developing a detailed research proposal, we were interested in the factors involved in the decision-making processes of transportation planning and use in Pretoria. We sought to understand the SUPE of inequality as a means of working towards greater fairness in urban transportation development and use. Our research project had two strands. The first concerned transport planning and policy, and asked the following questions: What influences the formulation of the master plan and its vision for Pretoria? And, who are the key stakeholders in the decision-making process, what are their goals, and how are they financed? This strand would also include a specific interest in informality–how it works in practice, how it lines up with the formal structures, and how it is associated with or cuts across customs and other written or unwritten rules. The second research strand concerned how transport services are used, and how these services are delivered. We further identified some overarching themes influencing the research. We were interested in the issue of safety–how it is perceived and how it influences transport choices in combination with critical categories such as class, gender, age, as well as other issues, such as the time of the day. Closely related to safety is the issue of order. How and by whom is order/disorder defined, enforced, and outlawed? Thirdly, we tried to understand transport users’ decision-making processes, including planned and spontaneous decisions. And, finally, we asked how these different thematic fields are interlinked with questions of identity. After visiting several parks in Pretoria, we became interested in how the parks naturalized ongoing forms of exclusion that spoke to the long life of apartheid. In their vegetation, their flower choices, their surveillance, and even their statues, parks made clear who was and was not supposed to occupy these spaces. We were particularly interested in the way that some parks became spaces of refuge or rest for homeless or exhausted Pretoria residents, while others were reserved for the leisure activities of a wealthier population. As we discussed these parks in relation to parks in each of our home cities or research bases, we realized that many of the narratives that gave parks the power to exclude and include–particularly narratives of “urban regeneration” or “sustainable cities”–appeared in other parks. What are the contested histories of the parks and how are these histories visible or invisible in the present? How do these histories manifest in park use, horticulture, and discourse? What is the relationship between violence and socio-nature? How do water, flowers, trees, and other forms of “nature” encode or enable forms of exclusion and inclusion? What other forms of violence (whether “hard” or “soft”) inhere in the making of the park, historically and in the present? How are discourses of sustainability, reclamation, and environmental amenities used in park “renewal” projects? What role do ecological and horticultural choices play in such renewal projects? What role do the parks play in the circulation of labor, leisure, and energy around the city? What historical, social, and ecological choices underpin this role? Our group decided to steer away from the “obvious” forms of security in the city, that is, the electrified fences, defensive architectural forms, fortress spaces, proliferation of CCTV systems, and so on. Instead, thinking about security from a UPE perspective raised the question of how ecology and “nature” are productive of, and in turn shaped by, discourses and practices of security. We looked at maps and aerial photographs of Pretoria to find inspiration, and hit upon the idea of studying apartheid-era “buffer zones”–open spaces or infrastructural elements that were planned and positioned to separate different race groups. We soon found the neighbourhood of Eesterust, which is still visibly separated from nearby residential areas by a band of open space greenery. We discovered that it was one of the first planned townships for “coloured” (mixed-race) people in Pretoria, built in the early 1960s. For a comparative (and contemporary) case, we decided to seek out a recently developed gated community marketed through the idea of nature-as-consumable and the appeal of a semi-rural middle-class lifestyle. Based on our observations, we began to construct a research problem and several key questions. We considered that although there is an increasingly close connection between practices of naturalization and securitization at a range of scales (e.g. through the militarization of nature conservation, the fact that natural resources are increasingly major security concerns for states globally), we lack an adequate understanding of how these discourses and practices interact to produce unequal socio-natures in urban environments. We asked, how do nature and security produce each other in the contemporary city? How do spaces of eco-security provide opportunities for alternative uses? How do they function to resist change? We were interested in how people experienced and interacted with nature to produce new subjectivities, and how psychosocial factors fed into the naturalization/securitization dialectic. We were also fascinated by what the concept of “buffer” could offer to urban security studies: on the one hand because it seemed (by its very multi-definitional nature) to highlight the close connection between natural conservation and socio-spatial exclusion; and on the other because seeing securitization through the notion of “buffer” would mean recognizing the permeable, transitional, multi-scalar and temporal aspects of such practices and infrastructures. In our view, this analysis would permit a nuanced, more transgressive understanding of urban securitization beyond the “hard”, exclusionary model of the “carceral city”. We defined landscape as the view as far as the eye can see. Thus we recognized that it is the interaction between the physical land and humans that creates landscape. To better understand this interaction we used Google Earth to identify spaces within Pretoria that might provide interesting views and to identify landscape features that were used for racial segregation in apartheid planning. Ultimately we were interested in seeing not only different views of the landscape but also how people’s places within the city may influence how they view it. 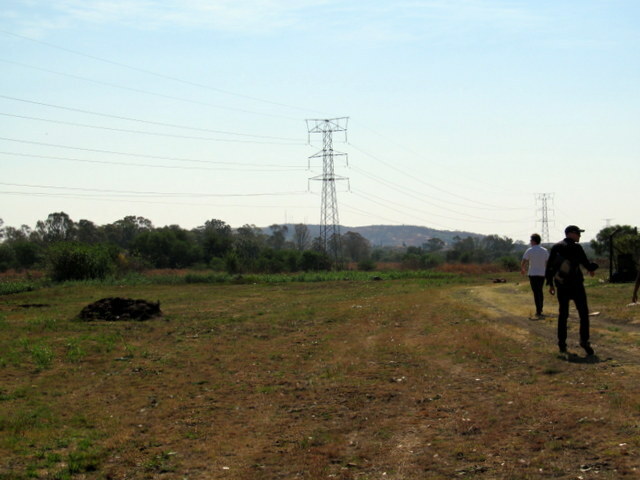 We identified three places of interest–Mamelodi township, the Roodeplaat Dam, and the Union Buildings. All three are part of Pretoria’s landscape but are located about 25 kilometers from each other, a distance that leads to unique views of the city. In Mamelodi we visited an informal settlement called Stoffel Park where we saw the widespread lack of formal services. In particular, residents there identified the lack of household electricity connections as a major problem, especially since electrical lines actually cross overhead the area. 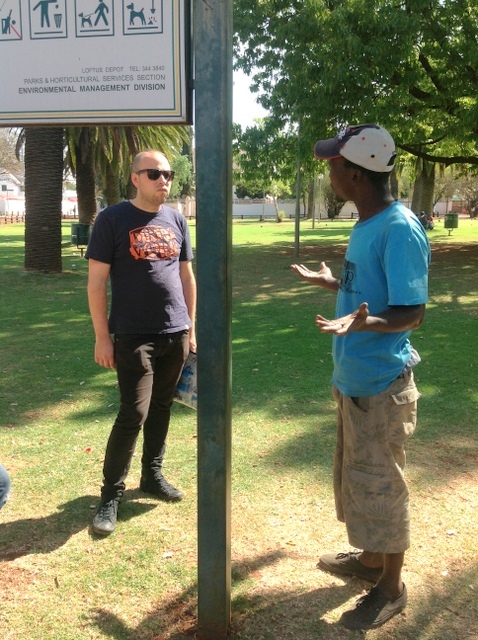 It was clear that Stoffel Park is part of Pretoria but its residents recognized their tenuous place within the wider city. Roodeplaat Dam is an exclusionary urban landscape where people can fish or relax by the reservoir–provided they can afford its entrance fee. People there expressed mixed reactions about whether this space was part of Pretoria, divided along racial lines. 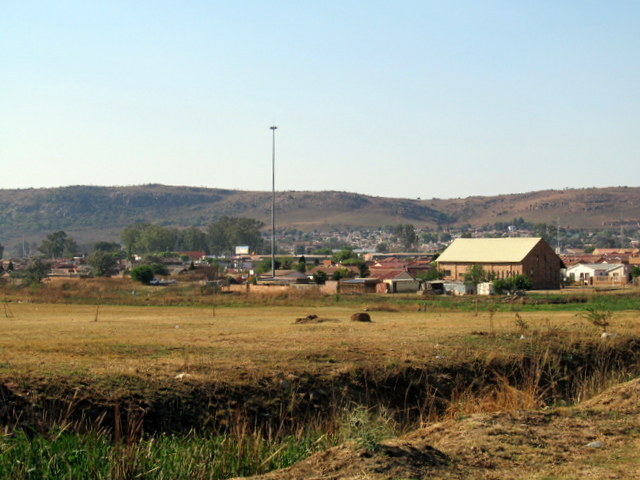 It was interesting to see the middle-class suburbs and gated communities near the dam, which offered a marked contrast from the township landscape. The Union Buildings–the seat of South Africa’s government–provided a more inclusive Pretorian landscape. Not only can you see much of the city from the buildings, but it also attracts a wide range of people to exercise, picnic, or pose with the new Nelson Mandela statue. Again, this place and its political power offered a contrast to the lack of power in Stoffel Park. Landscape and the interactions between people and their physical environments are an important component of a situated UPE. We clearly saw the imbalance of power, social injustice, and social exclusion at play in these three parts of Pretoria. We also considered the role of boundaries in shaping identity and place within Pretoria. We see research potential around the question of how psychosocial and environmental boundaries influence how people use and define the city, while recognizing that these boundaries can be porous and manipulated. We were curious, though, about how nature/ecology and commercial spaces in the Pretoria CBD are co-produced. 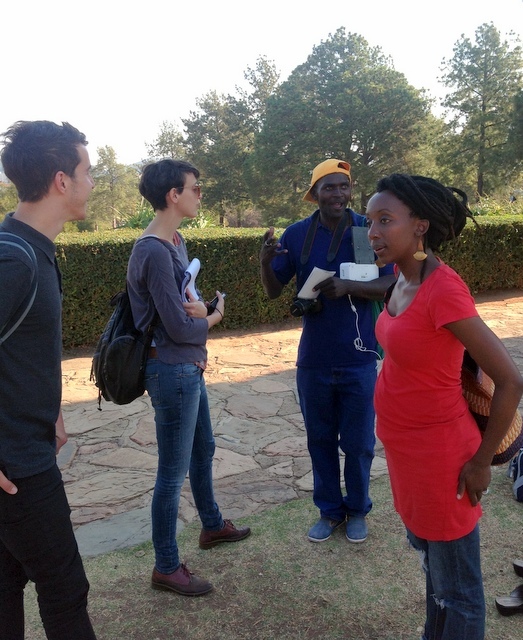 So we planned a transect walk starting from the University of Pretoria campus in the suburbs and extending to the CBD. This walk took us approximately an hour. On it we first passed through elite neighborhoods with both residential and embassy spaces (which were standalone buildings). Then we walked through the more mixed residential zone consisting primarily of apartment buildings. Once downtown, we stopped for a rest and to refuel, and observed the mix of formal and informal commercial activities in the CBD. We thought about how the buildings were designed to reflect formal economic practices and how these buildings are seats of power, particularly for banks and financial service centers. Then we thought about how the spaces of the streets were used by informal economic actors (like small-scale vendors and beauty services). We talked a lot about how the CBD was a white-only space during apartheid, and how it now must look quite different. We also talked about how the CBD was in some ways a “Northern” space, and this discussion really made us think about what makes something “African” and whether this is a useful epistemological category. We noted the changes in nature along the transect, from dense to sparse tree cover, and how this reflected income levels, just as we find elsewhere in the world. We talked about how trees were used to produce secure spaces and serve as a buffer between the street and the private space of houses in elite spaces, while in poorer areas there were fewer trees. How does train surfing in South Africa speak to rules/expectations around the use of transportation and the socio-technical regimes of the state? How are power relations in contemporary South Africa embodied in the practice of train surfing? What can train surfing tell us about the valuing/devaluing of life? One of the pressing questions we discussed throughout the workshop was “What can African cities offer to UPE scholarship more generally?”. So we debated what the modifier “African” could mean, and what utility it brings as a research concept. Some participants argued that it is not useful at all, that it is an affective concept evoking a stereotypical image of chaotic/disordered cities, and that we should drop it entirely in favour of respecting the unique variety of urban spaces in a world of “ordinary cities”. The counterargument was that “the African city” or “African urbanization” remains a powerful category of practice used by major institutions (including international development agencies and consultancies) and that we have a responsibility to contest the knowledge and practices tagged to this category. From my (the author’s) perspective, the term “African” can also be seen as a form of “strategic essentialism” that allows scholars to position themselves to speak back to general urban theory. In terms of particular research themes that present themselves with greater weight in the African context, we agreed that questions of identity, permeability/perforation, incompleteness, mobility, violence (in structural and physical, spectacular and banal forms), as well as demographics and youth are key issues for African scholarship, which may offer ways of speaking back to UPE and urban scholarship more generally. A particular concern of ours was to displace the stereotype of African cities as “disordered” and “chaotic”. Instead, we considered that notions of “permeability” and “incompleteness” (referring, for example, to the reach of the state) offer promising alternatives. Interestingly, we talked little about what notions of “blackness”, “black urbanism”, or difference could mean for thinking about urban forms and functions in Africa and elsewhere. For us, some key interrelated questions towering above the study of African cities are: Why is change towards more equitable and integrated cities so elusive? How do subjective, discursive, and material practices of “ordering” (the establishment of rules and norms) and exclusion promote the persistence of unequal socio-natures in our cities? How do ecology, violence, mobility, as well as questions of race, place, context, and history tie into this persistence? But questions also remain around what “expertise” Africa has to offer general knowledge of cities and urban change. Here we touched on some cursory points; in substantive terms, much can be learned from how African cities and urban residents deal with crises and “make do” in conditions of uncertainty and “informality”. UPE scholarship also stands to learn from the concepts and methodologies we use to study African cities. Arguably, the relative absence of a dominant “canon” of African urban research means that African urbanists can draw upon a wider range of theoretical concepts and analytical techniques than might be possible in more established centres of knowledge. In some ways this eclecticism was reflected in us, the workshop participants: our variety of disciplines and intellectual backgrounds allowed us to be innovative beyond the imperatives of using particular concepts and methods, or addressing particular theoretical debates. In our methodological discussions we spoke about using participatory photography and GIS techniques, sketching, street ethnography, collaborative mapping, community self-enumeration, archival analysis, filmmaking, cartooning, research by design, spatial demography, quantitative modelling, in-depth interviews, and transect walks, amongst other innovative techniques. This variety showed just how intellectually diverse a field like African UPE can be, and at the same time raised the intimidating question of how we might combine these techniques successfully within our research projects. Analytical approaches developed in the African urban context and geared towards capturing the flux of everyday life–or, more specifically, the dialectic of urban changes and continuities–are also well positioned to contribute to wider thought and analysis. But a word of caution may be necessary here. For all the emphasis on African cities and towns as spaces of flux, and hence the utility of UPE with its processual view of the city, a key task of African urban studies is to account for the persistence of things, like the material and social drivers of inequality, or the banality of everyday life in the city. Understanding how these continuities appear and are reproduced in concert with rapid urban changes is thus a key challenge for any African UPE. After the exciting group work process, we ultimately faced the question of whether we had the capacity and desire to carry out our research projects. Some group members intended to pursue the projects; others were honest about not wanting to work in South Africa. Others still were more interested in the issues and approaches discussed by other groups. Figure 11: Workshop participants relax and smile after a hard week’s work. 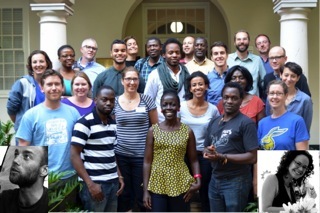 Pictured here are (from left to right), in the very back row: Sophie Schramm, Jonathan Silver, Gareth Doherty; second from the back: Mike Finewood, Godfrey Tawodzera, Shuaib Lwasa, Joe Pierce; third from the back: Claudia Grobler, Thulisile Mphambukeli, Thomas Aquilina, Basil Ibraham, Anthony Levenda, Jacob Doherty; second from the front: Sarah Smiley, Valerie Viehoff, Thandiwe Loewenson, Anesu Makina, Amiel Bize; in the front row: James Duminy, Prince Guma, Josephine Namukisa, Melu Ndlovu, Hilary Hungerford. Those not in picture are: Wangui Kimari, Henrik Ernstson (photo added), Mary Lawhon (photo added) and Ngaka Mosiane. But there were interesting affinities between the various group projects, which could perhaps allow us to integrate or reformulate the projects into an overall research agenda. For example, there were clear opportunities to consider urban buffer zones in relation to the production of boundaries in the urban landscape; how commercial spaces and urban parks embody securitization/naturalization processes; and how infrastructures of naturalization and mobility serve to drive the persistence of socio-spatial inequalities. All five of the research projects were broadly concerned with how formality and informality intersect and produce each other in urban space, and how rules/norms of space are established and transgressed. Combining individual research problems and questions into an over-arching project is no mean feat. Neither is building an active international network of collaborating researchers. It will take the concerted effort of several key individuals to create and sustain a network of young, committed UPE scholars. I feel that I speak for my fellow participants and friends, however, when I say that this sort of initiative is something extremely worthwhile, and worthy of effort and sacrifice. The next UPE in African cities workshop has been preliminarily scheduled to take place in Kampala in 2016 (see http://www.situatedecologies.net/). We hope to see you there. On behalf of the participants, I would like to thank the workshop organizers (Henrik Ernstson, Mary Lawhon, Anesu Makina, Ngaka Mosiane, Joe Pierce and Jonathan Silver) for their tireless work in putting together the programme, and for making the many logistical arrangements. Thanks are also due to: the Antipode Foundation for their generous financial support provided through an International Workshop Award; the Swedish funder Formas for their financial support through the “Ways of Knowing Urban Ecologies” project (lead by Henrik Ernstson; grant number: 250-2010-1372); and the University of Pretoria for hosting the event. This report was composed by me with input from the participants and organizers. Thomas Aquilina, Amiel Bize, Gareth Doherty, Jacob Doherty, James Duminy, Mike Finewood, Prince Guma, Hilary Hungerford, Basil Ibraham, Wangui Kimari, Thandiwe Loewenson, Anthony Levenda, Thulisile Mphambukeli, Josephine Namukisa, Melu Ndlovu, Sophie Schramm, Sarah Smiley, Godfrey Tawodzera and Valerie Viehoff. It is worth noting that as a small but growing field, nearly every substantive topic of UPE analysis (including water) is currently under-researched.